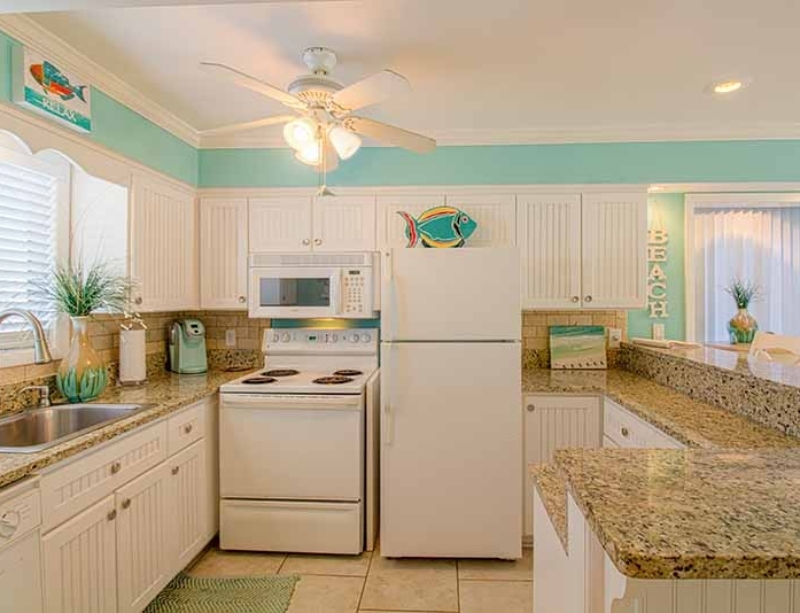 The beach is your backyard at this ground-level 2BR/2BA updated condo for 6. 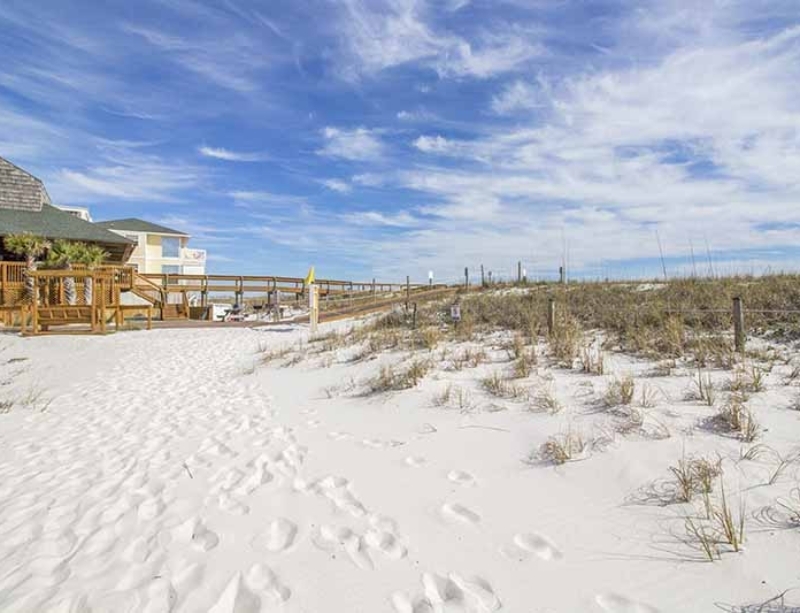 With a desirable location in the Beachside area of Sandpiper Cove, you can walk from your covered deck to white sands and wander down a boardwalk that leads to world-famous Destin beaches. You’ll feel spoiled by resort-style community amenities, including pools, a par 3 golf course, and a restaurant, all within walking distance. When you arrive at Unit 1138, it’s easy to bring your luggage in with parking right outside the door—no luggage carts necessary. 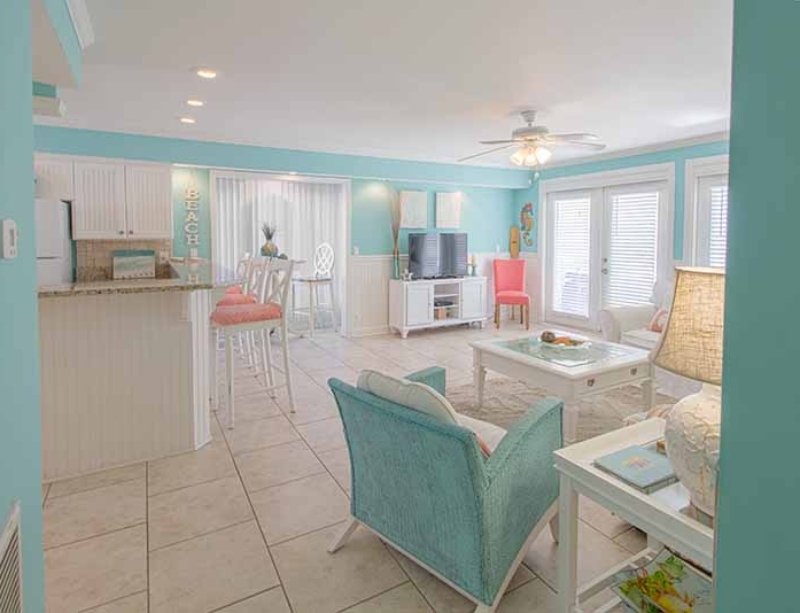 The tiled open-concept living area is spacious, bright and beachy, with blue ocean tones. Lounge on a comfy sofa (which folds out to sleep 2 guests) in front of the flat-screen TV with Blu-Ray player, perfect for movie night. Pop the popcorn in the kitchen’s microwave and don’t miss a scene. This newly updated and fully equipped space has a refrigerator, dishwasher, and dual-level granite countertops that double as a breakfast bar for 3. Whip up an easy meal or pack beach snacks, and with a washer and dryer, you can keep your outfits fresh. Dine at the breakfast bar and at a high-top table for 2 in a charming alcove. The covered patio deck will be your haven in the afternoons. Grill dinner on the new gas grill while the kids play in the sand, and then dine alfresco at a table for 4. At the end of the day, you can keep up with your favorite late-night shows from the comfort of your sheets: the two bedrooms both have flat-screen TVs. 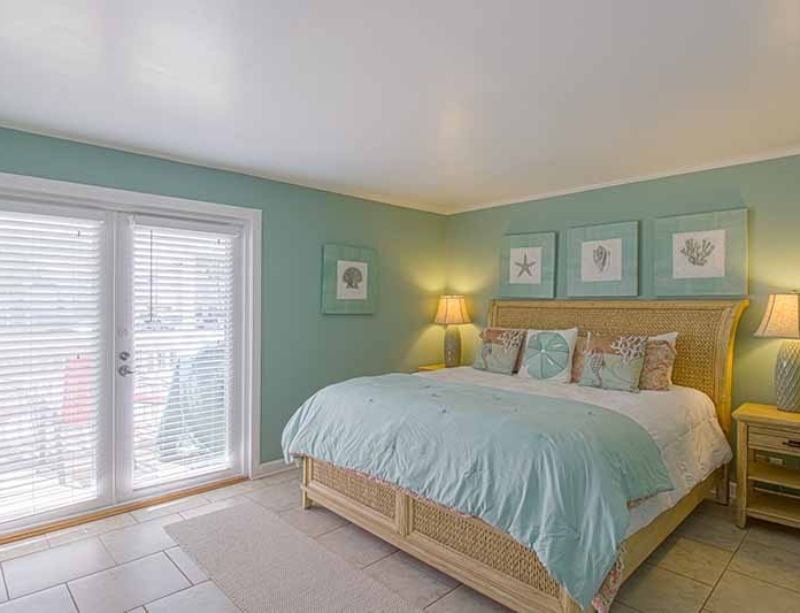 Fall asleep to the sound of waves in the master bedroom, featuring a king-size bed with wicker headboard and French-style doors to the patio. The second bedroom offers a queen-size bed with unique starfish lamps – just right for reading in bed. 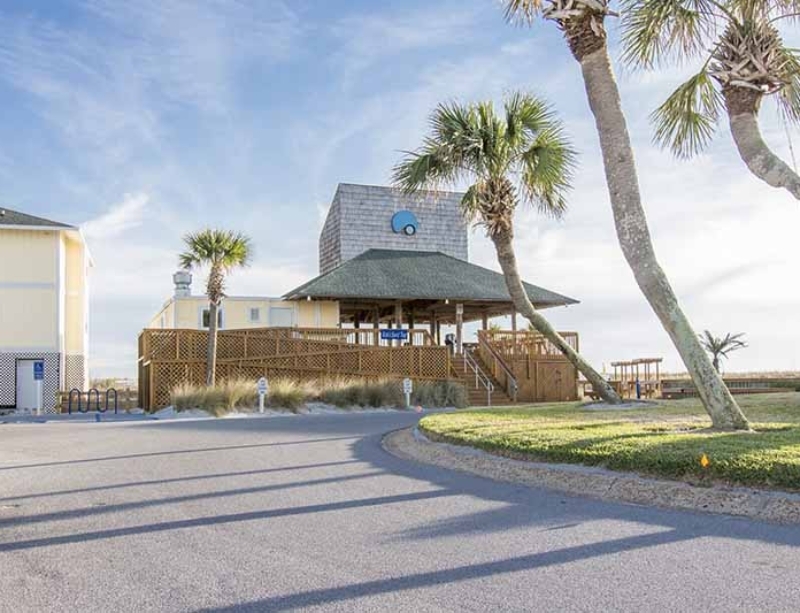 Spend the day at the beach and explore all Sandpiper Cove has to offer: a 9-hole, par 3 golf course, 5 swimming pools, 3 hot tubs, shuffleboard, tennis courts and horseshoes. When you’re ready for even more adventure, Sandpiper Cove also has harbor access. Visit the onsite beach pavilion bar to schedule some parasailing or rent jet skis, kayaks, umbrellas, and more chairs. Grab one of the best hamburgers on the coast while you’re there. After a full day, you’ll be ready for some fine dining at the on-site gourmet restaurant, the Louisiana Lagniappe, which serves fresh seafood with a Cajun/Creole character. If you can’t tear yourself away from sunset on the beach, enjoy a burger and a cold drink at Rick’s Sandtrap, the beachside bar and grill. 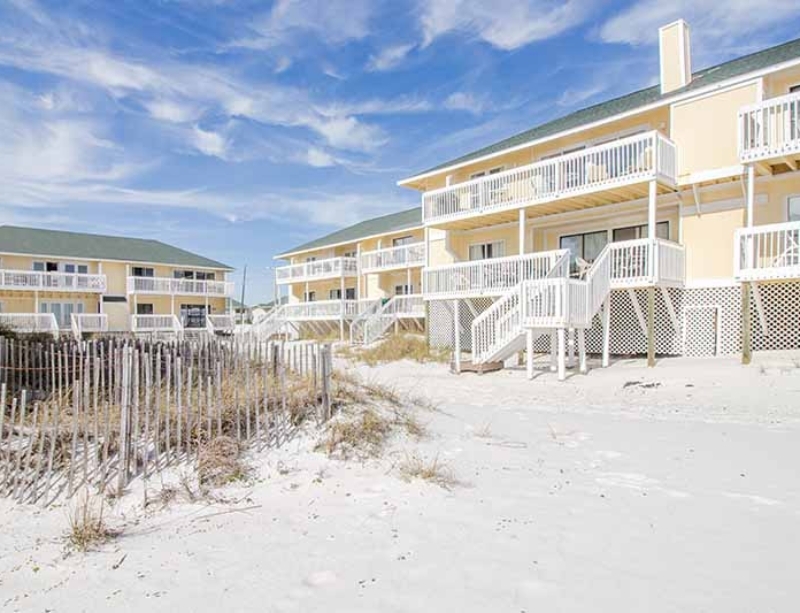 This Sandcastle by the Sea will be your picture-perfect coastal getaway while you enjoy the water and sands of Destin, while vacationing with Twin Isle Vacations. Looks out onto the beach. Quotes don’t include Florida sales tax of 11% & $125 cleaning fee. $200 refundable deposit after owner inspection, nonrefundable if canceled 30 days of arrival and deposit due 7 days after booking. Full payment due 30 days prior to arrival. Ask about monthly/snowbird rates. I’ve probably stayed in at least a dozen condos at Sandpiper Cove and this one is by far the best! Very clean, comfortable, tastefully decorated, and spacious. The kitchen is well-equipped and the living room furniture and beds are super cozy. The deck is amazing!!! You’re able to see the water and hear the waves while relaxing on the covered porch. The proximity to the beach was perfect for our almost 4-year old and it’s just a short walk across the street to one of the pools. Lindsay was great to work with- responsive and friendly. We LOVED this condo and can’t wait to go back! Sandpiper Cove was the perfect family getaway! Had a wonderful week at the condo. You cant beat the location! The boardwalk over the dunes is just a few feet away and you can hear the ocean from the back porch. The unit is clean and kept up with and very quiet. We never once heard any of our neighbors. The location in Destin is great too. It was so easy to get from place to place. Highly recommend!! Great beach access with 2 small kids. Clean room with amazing porch! This is our 2nd year in a row staying in this condo and our family loves it! It is always clean and ready for us when we arrive. If you do need anything Lindsay is very quick to respond back to you. We love that we have beach access from the back deck. The deck is very big and we love that while we grill out our kids can play in the sand. We love this place and always look forward to planning the next years trip! We thoroughly enjoyed our time at your condo! So convenient to EVERYTHING and the beach was beautiful!!!! We will definitely stay again!! Perfect Vacation and Everything Else!! 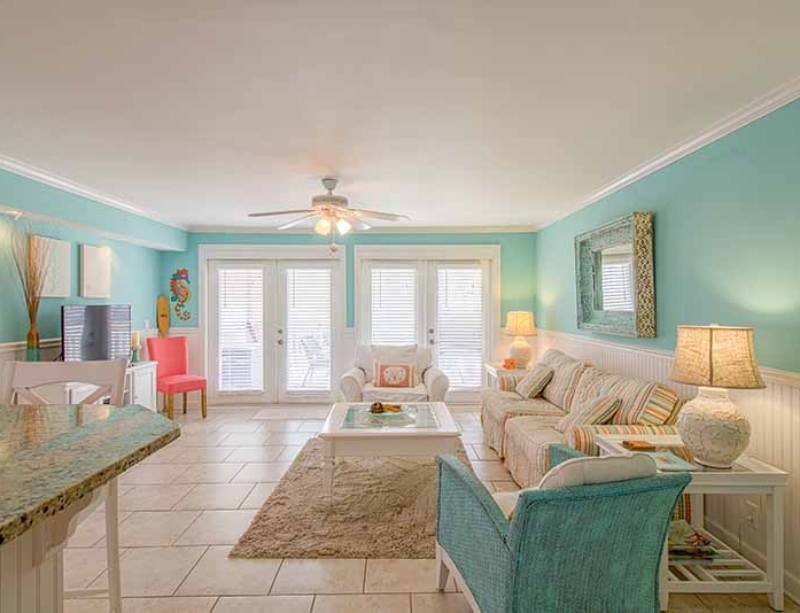 We had a group of six girls looking to have a fun and relaxing time in Destin and we found it here. The owner’s were more than understanding and always a phone call away if we needed anything. All in all, this condo is a perfect get away and all six of us give the best ratings you can give! Can’t go wrong with this rental! 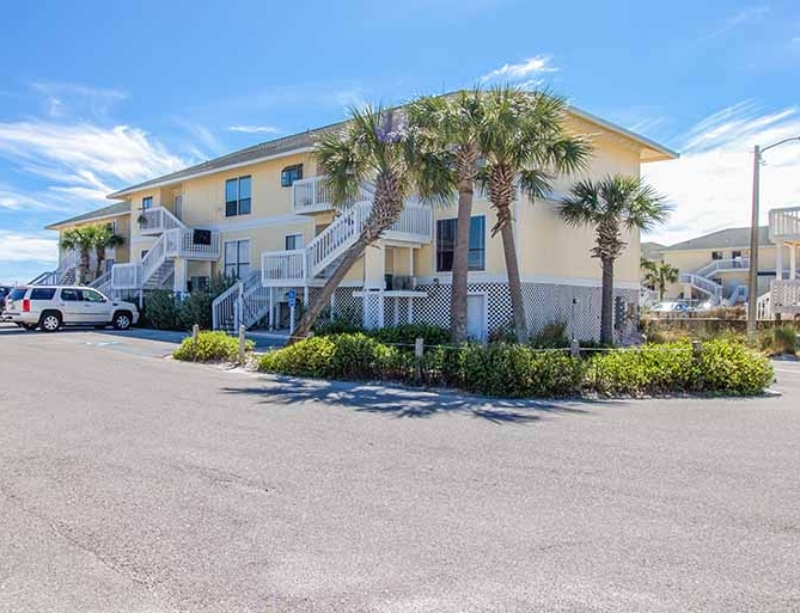 This property was in a great location, convenient to everything in Destin and not in the middle of the traffic mess. Loved being on the beach side and the convenience of being able to walk straight out to the beach. You can’t really see the ocean from the condo but you are definitely right on the sand and have a distant few of the water (over the sand dunes). The patio is SUPER peaceful in the morning to have coffee and read a book. The tiki bar/restaurant on the beach wasn’t open at all while we were there so I’m assuming it is just seasonal. I went with my dad and my malti-poo and it was a perfect size for us. Everything is not in perfect condition but definitely one of the nicer ones we found that were pet friendly. My only suggestion would be to add a set of sharp knives and maybe a better blender. I make smoothies and the only thing I had to cut with was a butter knife. Also, the beach chairs are a little rusty and worn, but we found a couple that worked. The master bed was really comfy and my dad liked the guest bed, which was much more firm. The owners were great to work/communicate with. Awesome views and proximity to everything! Very “homelike” and comfortable. The owners Beverly and Lindsay were responsive and the property staff were great. The views were amazing. Dolphin sightseeing on the Hannah Marie and the food at Louisiana Lagniappe were well worth it. Definitely want to go back! This condo is wonderful. Very clean and decorated perfectly throughout the entire place. For us the location was perfect as it was just steps away from the beach, close to the grocery store, Target and many restaurants. The best part is you get to miss all that traffic when you stay a bit further down the road like in San Destin. We ran into one small hiccup trying to check-in as they did not have our names on the list at the guard’s gate, but the owners were very responsive when I called from the gate and we got it all squared away within minutes. We had 4 people in the condo, two adults and two teens, and thought it was the perfect size. It has a pull out coach which I think you could probably put a few small kids. The furniture was clean, comfortable and cozy. Nice porch to sit outside and enjoy the view and the porch furniture was very nice. We will definitely stay here again next time we get to visit Destin. I have taken 5 beach trips this year staying in a variety of places on the gulf coats. This condo ranks pretty high due to the easy parking, modern furnishings and convenience. The condo is updated, nicely decorated very close to the beach walkover as well as steps to the outdoor restaurant at the beach. The deck is a great size and well furnished. 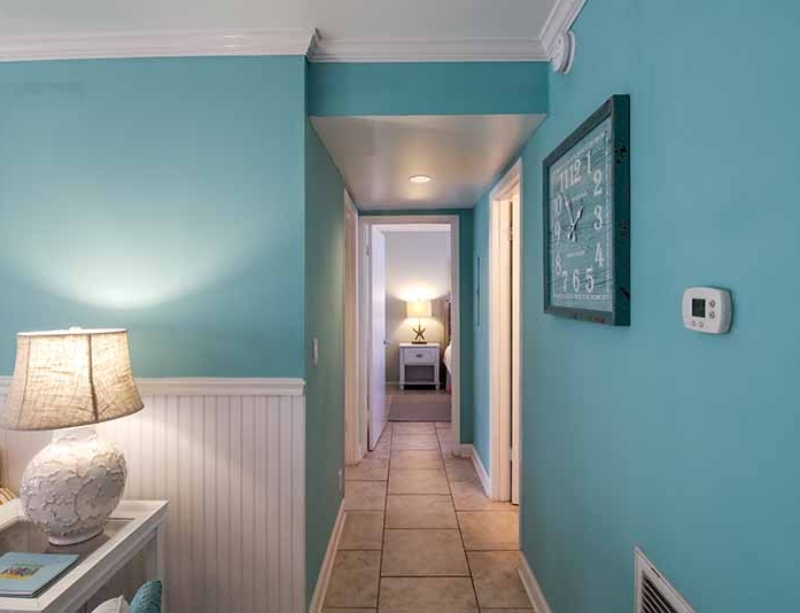 This condo is one of the best in Sandpiper Cove. The owners are wonderful to work with. Definitely recommend this unit to anyone. We had a blast! Clean, close to grocery, restaurants, water park…perfect place to kick back. The condo was wonderful. Our only complaint was that the window treatments in the second bedroom did not allow you to sleep past about 6:00am. It was sooo bright in there! We would love to make this a family tradition and come back to the condo. Thanks! This condo was a wonderful place to spend Spring Break. The condo was clean and wonderfully decorated throughout. We had friends who stayed in other condos in Sandpiper Cove but they were all jealous of our condo. Thanks to the owners for providing a great place to vacation and making the booking process easy. Wonderful unit! Master bedroom has the best mattress ever. Great location on the beach. Can even walk to restaurants. We will be back! We loved our stay sandpiper. Planning on going back in the spring. So happy you enjoyed your stay, pamela! We look forward to having you and your family again soon. Love this condo! 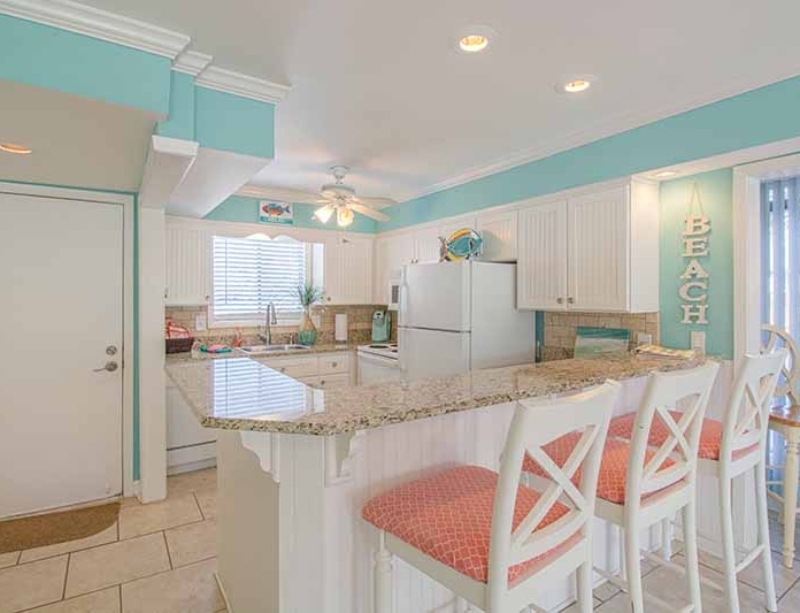 Right on the beach, walking distance to restaurants, clean and cozy!